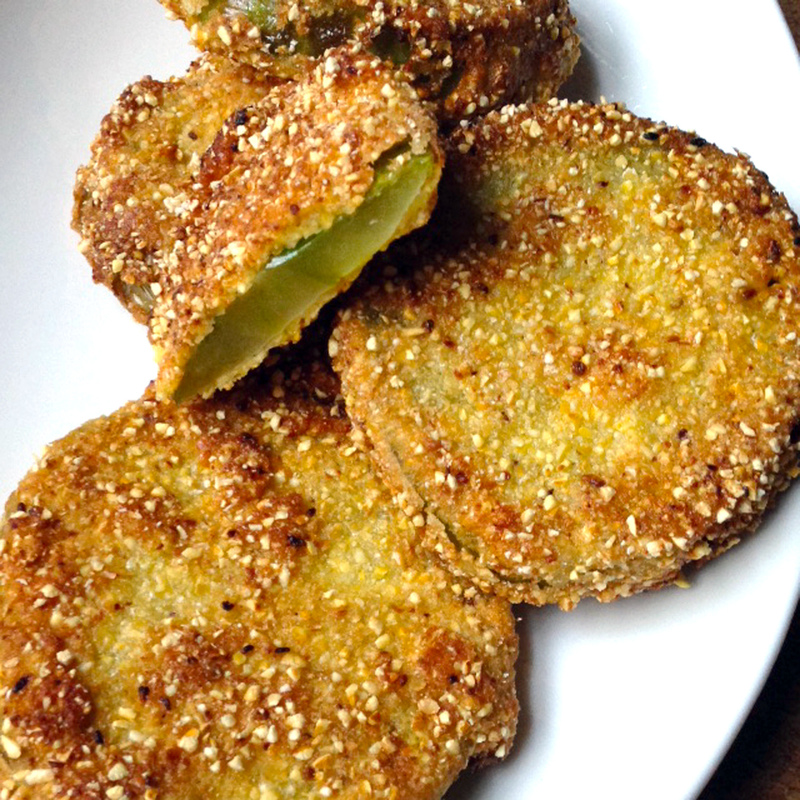 I have posted about my love of green tomatoes in the past, but you can never sing their praises too often. They are one of those vegetables that no one has figured out how to bring to the market in the middle of January. 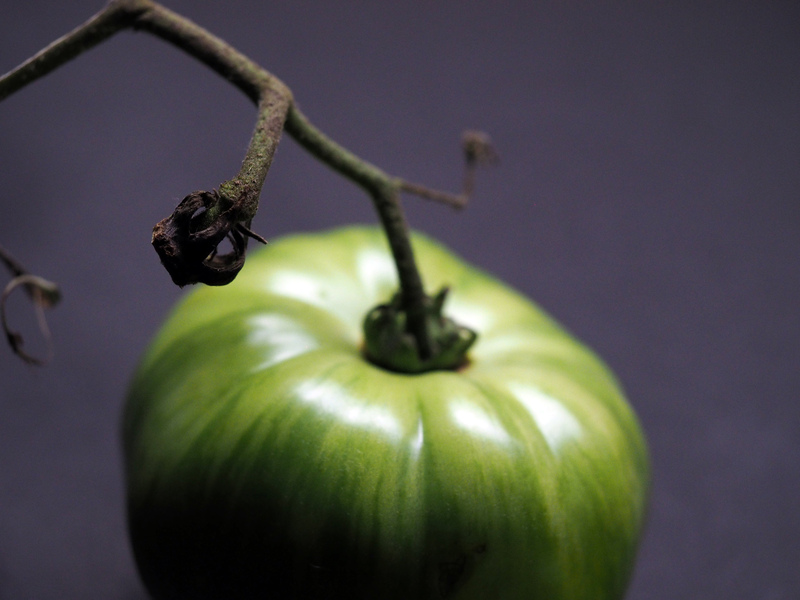 Only in the mid to late summer can you find beautiful green tomatoes right off the vine carrying that pungent fragrance. My husband Steve had a fascinating aunt, Rubie, who when she was very much alive and a gardening fool, would send me a big box of green tomatoes individually wrapped in newspaper that she instructed me to “fry up and few and set the rest on the window sill to ripen.” You know what, that’s exactly what I did and I had sunny, bright red tomatoes for weeks throughout the early fall. The green ones that I fried got this treatment. To serve six people, you will need about 5 large green tomatoes. Place the tomato slices on double layers of paper towel to drain slightly. Whisk the eggs and buttermilk together in a large, shallow bowl. Place 1 cup of the Wondra flour in a large shallow bowl. Combine the remaining cup of flour, cornmeal, and salt and pepper in another large, shallow bowl. Heat a thin layer of oil in a large frying pan over medium heat. When the oil is hot, working with one at a time, dip the tomato slices into the plain flour, then into the milk mixture and finally into the flour-cornmeal mixture, pressing down to coat evenly. Shake off excess and place in the hot pan. Fry each slice for about 3 minutes. Turn and fry for another 3 minutes or until crisp and golden on both sides. Using a slotted spatula, lift the slices from the pan and place on paper towel to drain. Serve hot with a spritz of fresh lemon or any tart relish or condiment. Or, if you like, make a cream gravy in the pan and drizzle over the tomatoes. Steve, my photographing husband, does not much like green beans. I have no idea why as I find them bland with nothing off-putting at all. 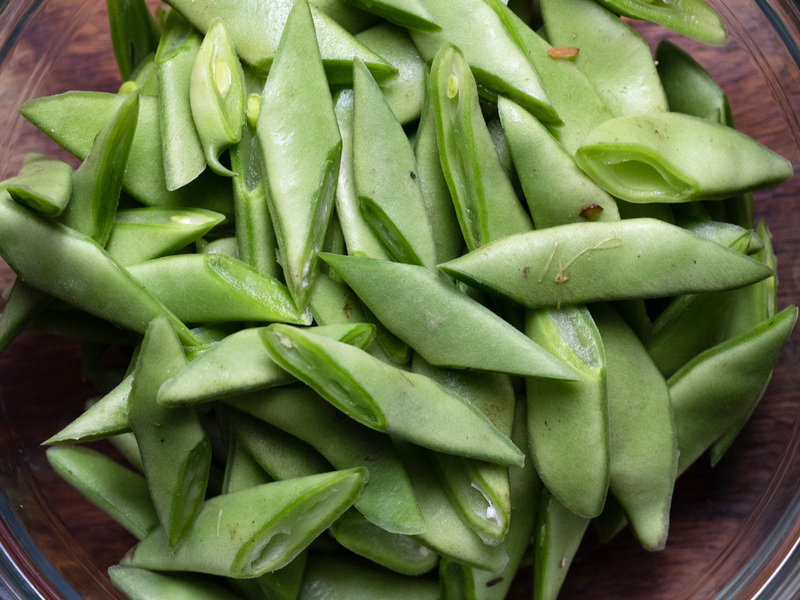 However, I introduced him to what I call broad beans, but which are actually Romano or Italian beans, he took a liking to them so when I can find them they sometimes take the place of ordinary green beans. I find their flavor richer and like to mix them up with other vegetables – corn, onion, and broad beans being one combo I’m particularly fond of. I also like to use them in a light pasta. 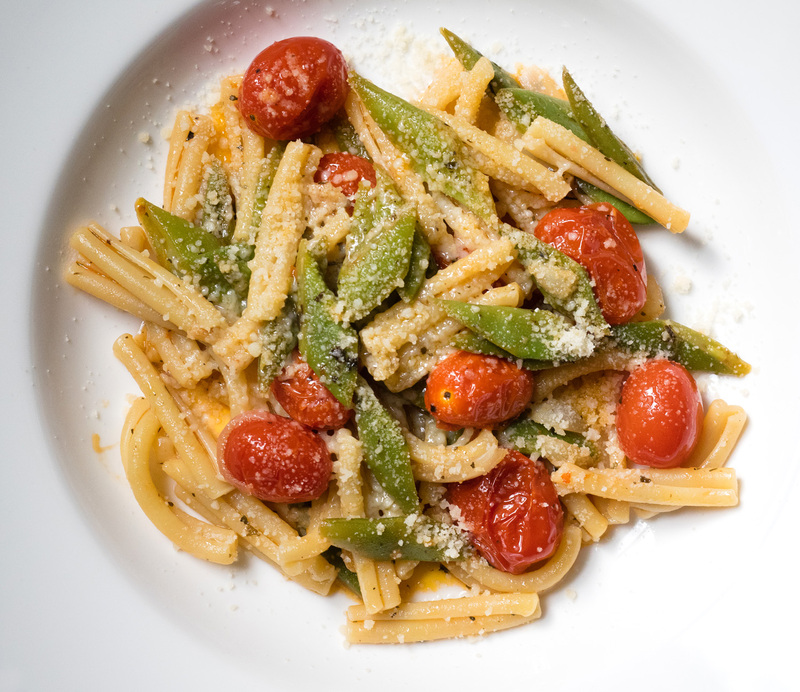 The one in this photo is sliced broad beans, cherry tomatoes, garlic, sweet onion, and basil with a good dose of grated Parmigiano. Light, filling, and healthy, too. With summer almost here I decided that maybe, just maybe I should lose a few pounds. Not that I’m ever going to be seen in a bikini, but just because in the hot New York summer you need to feel lighter. So, since less pounds translates to less food on the plate, I have been trying to eat more salads for dinner. This is one I came up with using ingredients I had on hand. 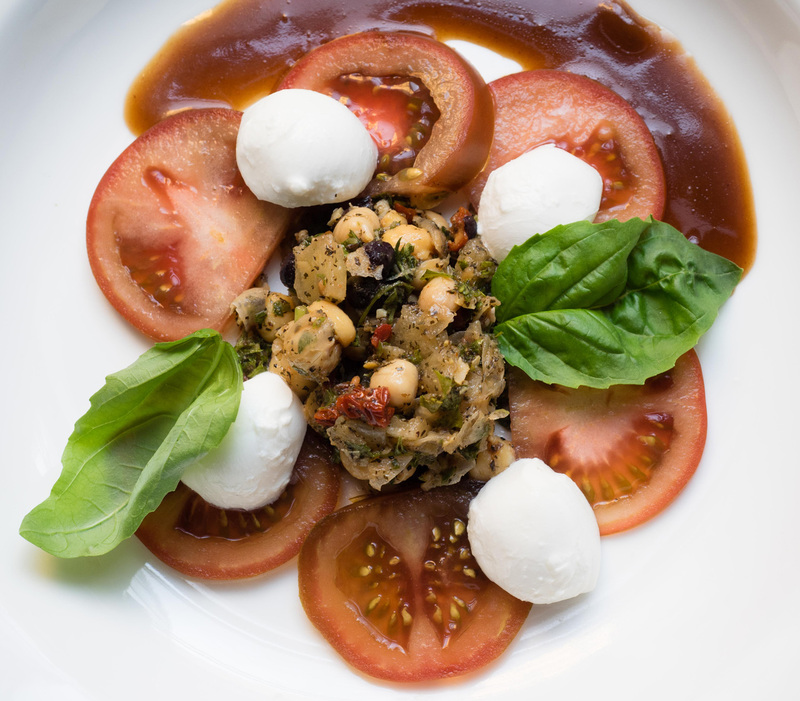 The center is a mixed bean salad that was a bit spicy (black and red beans along with chickpeas, chopped onion and sun-dried tomato, chopped herbs, a little fresh chili, olive oil), around and about some sliced tomato and bits of bufala mozzarella and some fresh basil. I drizzled some balsamic vinaigrette around the edge of the plate and had a very satisfying dinner.